Includes 2 Microsoft Office 2000 Small Business Edition Edge-to-Edge Hologram OEM CD's with a key code on a generic white sticker. Publisher 2000 is used for creating professional-looking brochures, newsletters and other marketing materials at a fraction of the cost, Publisher 2000 offers improved templates, wizards and color schemes. Publishing can be done from a desktop printer, commercial-printing services or on the Web. New wizards include Quick Publication and Catalog for product catalogs and single-page documents. There are also sixty customizable color schemes with which to work and commercial printing support (i.e.4-color process separations and spot color). Over 2,000 publication templates, 40 design sets, and a vast assortment of clip art, photographic images and animated GIFs accompany Publisher 2000. 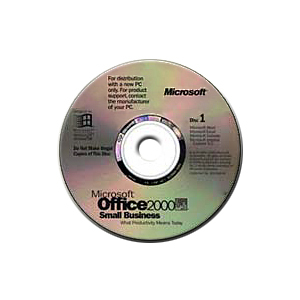 Small Business Tools; This program is the most underrated and overlooked aspect of Office 2000 because not many IT magazines focus on it. Owner/managers (your clients) will be able to keep track of their customers, locate reference information and create financial reports, such as A/R, A/P and cash flow projections. Accountants and consultants can use these tools as a value-added service, especially with components like Business Planner and Buy vs. Lease Wizards to analyze appropriate financing requirements. There are four Small Business Tools categories, which is a vast augmentation from the Office 97 version.